This client stopped by our booth at a local Home and Garden Show. They were excited about their new home that they could move into in a few months, but needed a lot of help and advice about what to do with their backyard. We set up a free design consultation with them, since they were starting with a blank slate. With so many choices available, it can become overwhelming very quickly. We sent an expert to help them decide which products they liked, assess any drainage concerns and see the lay of the land. The client's expressed their urge to be able to enjoy two separate but complimentary areas outside. They decided that they would like to have a deck off of their living room and a patio with a fire-pit beside. The deck area is lovely to enjoy a cookout with family and the patio and fire-pit are great for entertaining friends by a fire. After this initial consultation, we created a design using our 3D design software, complete with our most current product lines uploaded. This design included a deck using Unilock Timbertech Composite decking and rails, and Unilock Artline pavers for a beautiful custom patio. After Creative Earthscapes acquired the approvals from the Homeowners Association, the City zoning and building we were all ready to go. Taking care of the approval process is just one more way we try to make this process seamless for you. 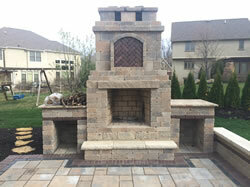 Outdoor Living That You Won't Have to Worry About! An outdoor living project like this is an investment and you want to be sure that you are getting the best value for your money. 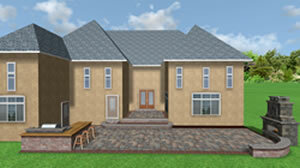 Also you want to be sure that you are adding value to your home with quality products that will stand the test of time. 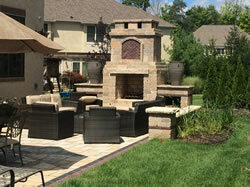 Our services are worry-free because if we install your paver patio or deck, our work is all warrantied by us for 5 years. Since we only use top of the line products, most of them are covered by a manufacturers warranty some of them for as long as 25 years!